On the operability of the Municipality’s Services. On keeping the citizen and the visitor informed. Public Works: With a simple and effective way the municipality can directly update the statuses of public works, performed in the geographical boundaries of the municipality. With their registration, the municipality informs the citizens, but also creates a geographical basis as a management of these projects. So a search by period of works done can be carried out, by type and by geographic region. 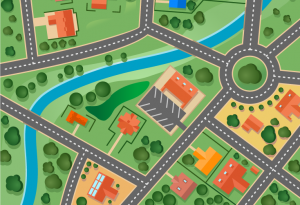 Municipal Property and Branch Management: The SmartCity Platform allows the efficient management of the municipality’s property, but also of the areas that are rented to third parties. For each property a different section is created that includes all basic and desirable features. Manage Points of Interest and service points: The management of general services for citizens (Citizens’ Service Centre, Municipal Services, Schools, etc.) and general points of interest (churches, squares, and shops) can be done simply and effortlessly through the application. Urban Details: The digitization and management of polygon data and characteristics, with all accompanying files, can be displayed on the map and significantly reduce the need for citizens to know what applies in each block, and each area of the existing town plan making. Network Management: The monitoring and displaying of all municipality’s networks (water supply, sewage, power and lighting and of course the road networks). Civil Protection: Visualization of points and areas can be easily digitized and entered into the system. So whenever the information is needed, the municipality’s services will know not only the location but also the status of each resource that has been deployed. Waste management: The planning of the waste collection, but also the certification of the project, are essential components of an effective cleaning service. Telenavis platform combined with telematic monitoring and certified devices specialized for waste disposal, simplifies the procedure making it more effective and more environmental friendly. The Road Network of your city. The demographics of your city which is based on the official census of the National Statistical Service of Greece (NSSG). The premises rented by OTA to third parties. The Schools and the Municipal Points of Service. The authorizations granted for stores or farmers’ markets. Telenavis SA., a highly experienced firm in the organization of Civil Protection in Local Governments, can contribute substantially ιn the preparation of projects and management natural and technological disasters. Developing an Action Memorandum, according to the national contingency plans. With the creation of an information system for recording both the Memorandum and monitoring the operations. With our specialized partners and knowledge of the legislative framework, but also with practical experience we can help you to implement it directly. Through the use of Geographic Information, it is possible to create detailed mapping and an inventory of all possible risks, municipal infrastructures, resources, instruments and actions that are required the relevant departments of the municipality. The implementation of monitoring systems and management of resources (intervention teams, search and rescue, vehicles etc.) in the field during the development of an incident, using specialized equipment (GPS – cameras – digital sensors – PDAs) and the use of telematics.